Some weeks ago, I came in touch with the very sympathetic Italian guy Raffaele Pezzella, who’s the very same guy behind the great project Sonologyst. In a (near) future, I will write and publish a review on their latest album Silencers, by the way, which is available via Cold Spring Records as from yesterday. Deep investigation done by undersigned taught me that Raffaele is the very same guy who runs Unexplained Sounds Group, which must be one of the most open-minded labels within the international Experimental / Ambient / Drone / Minimal scene. And not that very long ago, he created a sub-label too, Eighth Tower Records, which totally blew me away with some magnificent releases. 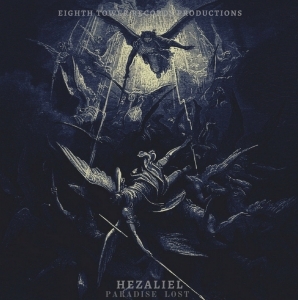 You need to check out their Bandcamp-pages (https://unexplainedsoundsgroup.bandcamp.com & https://eighthtowerrecords.bandcamp.com)! The cover image, by the way, is based on the same-titled and known work of Paul Gustave Doré – FYI. Paradise Lost is a fifty-minutes experience, divided unto eight titles. And as from opener The Pit Of Hell, you’ll be subject to the hellish, post-apocalyptic and suppressive monumentalism of Hezaliel. Eerie drones, ominous sounds and heavy machinery come in a multi-layered symbiosis, creating a suffocative and industrialised soundtrack. It’s like alien, but not of the astral kind, nor spacelike – rather focusing on that mostly uncomfortable feeling of being lost in a vast space, realizing your painful end is near, but not noticing when that end will actually take your mortal existence in a brutal, merciless manner. Feels lovely, not?! There’s a static sound approach, and at the same time an energetic dynamism, resulting in diversified walls of sound pollution. A couple of excerpts are fairly spookier, then again gloomy, grim, occult or just bleak in a mostly uncomfortable way. The abyssal, somewhat diabolical negativism at the one hand, and the rich, epic harmonies at the other, are contrast that machinate in a contemplative and immersive aural experiment.